For the past 3 months I've been publishing a series of posts around DevOps culture and lessons learned from Patrick Lencioni’s leadership book The Five Dysfunctions of a Team - A Leadership Fable. As much information as is contained here, the reality remains that teamwork ultimately comes down to practicing a small set of principles over a long period of time. DevOps success is not a matter of mastering subtle, sophisticated theory, but rather embracing common sense with uncommon levels of discipline and persistence. There are some fantastic theories out there that are worth brushing up on like The Three Ways which advocates 'system thinking' as a framework for seeing interrelationships rather than things and for seeing patterns rather than static snapshots. It is a set of general principles spanning fields as diverse as physical and social sciences, engineering and management. 5 Dysfunctions of a DevOps Team: Lack of Commitment, explored how organizations of all shapes and sizes need better buy-in around objectives and deliverables as it relates to their DevOps initiative. 5 Dysfunctions of a DevOps Team: Avoidance of Accountability, explored how clarity of new roles, expectations and KPIs are needed to hold one another accountable. 5 Dysfunctions of a DevOps Team: Inattention to Results, explored the ultimate dysfunction of a team and the tendency of team members to care about something other than the collective goal / mission of the group. 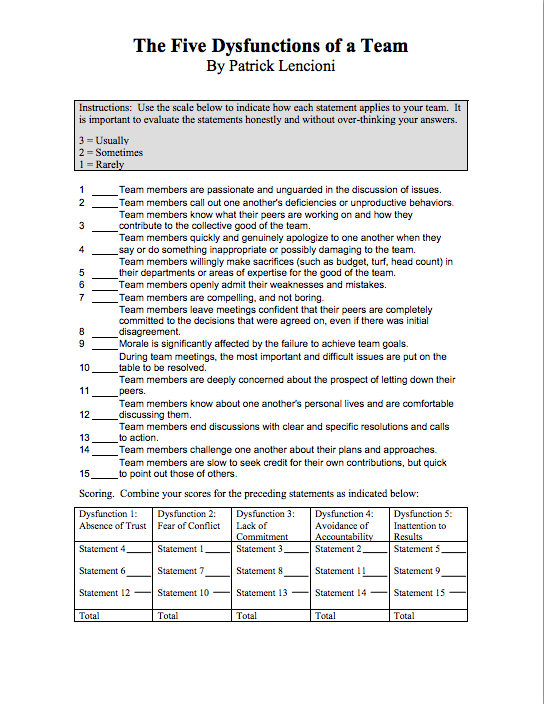 Furthermore, if you are interested in taking these lessons learned and evaluating your own team's susceptibility to the five dysfunctions, you can use this questionnaire tool straight from Lencioni's book to get started. If possible, have all the members of your DevOps team complete the questionnaire and then review the results as a team to discuss discrepancies in the responses and identify any clear implications for the team. A score of 8 or 9 is a probably indication that the dysfunction is not a problem for your DevOps team. A score of 6 or 7 indicates that the dysfunction could be a problem. A score of 3 to 5 is probably an indication that the dysfunction needs to be addressed. DevOps teams succeed because they are exceedingly human. And DevOps by nature is a people challenge. By acknowledging the imperfections of your DevOps team's humanity, members of the team can overcome the natural tendencies that make trust, conflict, commitment, accountability and a focus on results so elusive.